I truly thought homemade ice cream didn't get better than Christina's in Cambridge and Bi-Rite in San Francisco (they are both truly amazing!). Well, I stand to be corrected as we've discovered the most delicious homemade ice cream ever at Molly Moons here in Seattle. Flavors like Salted Caramel, Pumpkin Spice, Scout Mint and Balsamic Strawberry are offered as temptations. But it doesn't stop there--they also offer a menu of delicious toppings--one of which is homemade lemon curd (my recipe here if you want to give it a go). And anyone who has read this blog for awhile knows how much I love lemon curd! Sheer brilliance I tell ya. Between that, the ice cream, and the homemade waffle cones, it's pretty much heaven. I am not exaggerating when I say it takes considerable willpower to not visit every day. It's also a family-friendly joint thanks to the chalkboard, pint-size stools, and a little window where guys and dolls can watch homemade goodness being churned out for our ample consumption. i am having a flashback memory from seattle! 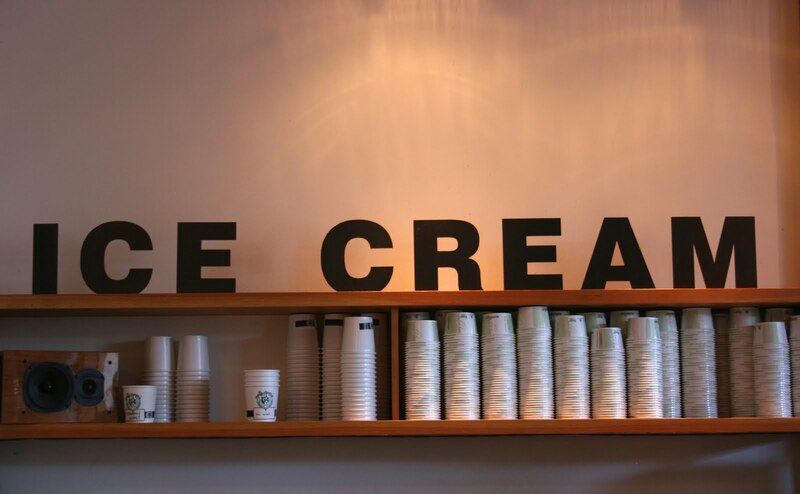 I LOVED the ice cream place. There is a long line outside even in the winter. I am so glad you found the place. OMG, Steph. Methinks that when I (finally) visit you and Cher, that I may have to indulge in the Honey Lavender ice cream despite the terrible series of symptoms that would accompany it. Oh, man...pretty grateful that this place isn't in Boston right now! You are killing me here! I haven't lived in Seattle in over 10 years, but still have such a love affair with this city and it's food! Luckily I come to visit family often, but right now all I want to do is move back to the city of my childhood, find a little house right behind this icecream shop and never leave. Seriously, I am going to be craving balsamic strawberry or honey lavender icecream ALL DAY. And the menu at Oddfellows looked super yummy too! I will have to live vicariously through you for now. we're going to molly moons on saturday! i keep hearing about it but these pictures make me even more excited! yay! the food scene here is amazing, i agree. I just have to comment that this is not homemade ice cream nor is it fresh... it is made in huge batches and pulled from a freezer when needed. It is an ice cream mix...the same one used by Husky Deli in West Seattle and Fult Tilt. Fult Tilt is far superior. This is also not a small independent ice cream shop...It is funded by a large group of investors who own several clubs and restaurants on Capitol Hill... The curd is made by a pastry chef connected with one of the many restaurants funded by this group. sounds divine! Salt Lake needs to step it up with our ice cream scene! love the look + sound of this ice cream heaven! makes me wish to visit seattle stronger. Oh, I love Molly Moons. I used to live in Seattle and really miss all the great food. On a somewhat positive note I have lost weight since leaving Seattle but I think I would trade that for a Cuban sandwich a Paseo and some good ice cream! Yum!! I want to try this for sure. yes, love the design there!! and how funny cuz i was just at BIRITE last night and blogged it today! I adore homemade ice-cream and lemon curd! Seattle is a long way from Oz but seriously I think I will put it on my destination list. It seems to have a thriving food scene. this place sounds amazing!!! I am ice cream fiend, too, and I'm visiting Seattle this winter. Thanks for the recommendation — it's totally on my must-see list! I think I'll have to try the lemon curd topping. Welcome to Seattle, glad to hear you are enjoying it! We love Molly Moon (and Trophy Cupcakes and Top Pot) too! I'm not surprised. Every time I head over, I have fantastic food. Overall, the food standards of the community as a whole will raise the bar for the what it takes to survive as a food joint. I wish the bar would be raised a little over here. :| Lucky you guys!